Tiny but beautiful, Sikkim is situated in the Eastern Himalayas, Spread below the Mount Kanchendzonga (8,534 mts. ), the third highest mountain peak in the world. It is one of the smallest state in India, with an area of 7,300 sq. kms. and measuring approxcimately 100 kms. from North to south and 60kms from East to West, the elevation ranges from 244 mts. To over 8,500 mts. Above sea-leavel. Sikkim is the richest treasure house of India�s Flora and Fauna. It is a landlocked state, bounded by Tibet in the North, Bhutan in the East, Nepal in the West and state of WestBengal in the south. Sikkkim is the most peaceful land divided into four districts which are known as East, West,North and South Sikkim. The river Teesta is the life line of Sikkim. 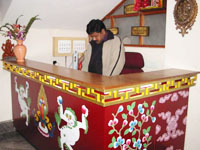 Hotel Tibet Gallery is located at Nam Nam Road, just 5 minutes walk from M.G.Marg, the heart of the capital city, Gangtok. You can enjoy the enchanting views of Mt. Kangchendzonga from Restaurant, Rooms & Terrace. 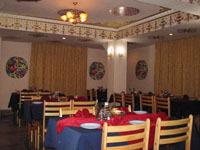 �Amaravati� our multi-cuisine restaurant serves the best vegetarian food in town. 9. 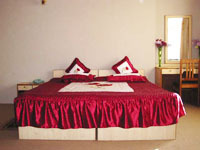 Well furnished rooms with personal bathroom. 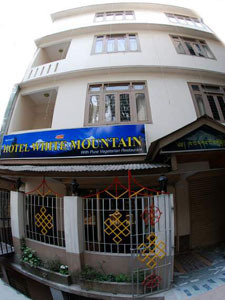 Welcome to Hotel White Mountain, with pure vegetarian restaurant. Designed for the people who are looking for special comfort. Tiny but beautiful, Sikkim is situated in the Eastern Himalayas, Spread below the Mount Kanchendzonga (8,534 mts. ), the third highest mountain peak in the world. 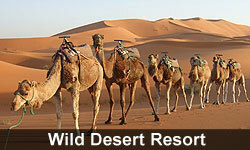 It is one of the smallest state in India, with an area of 7,300 sq. kms. and measuring approxcimately 100 kms. from North to south and 60kms from East to West, the elevation ranges from 244 mts. To over 8,500 mts. Above sea-leavel. 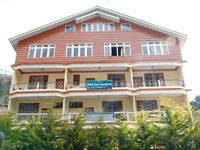 Sikkim is the richest treasure house of India�s Flora and Fauna. It is a landlocked state, bounded by Tibet in the North, Bhutan in the East, Nepal in the West and state of WestBengal in the south. Sikkkim is the most peaceful land divided into four districts which are known as East, West,North and South Sikkim. The river Teesta is the life line of Sikkim. 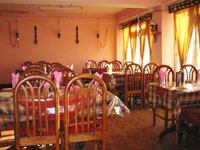 Hotel MarigoldGangtok is the Capital of Sikkim at an altitude of 1,600 mts. Above sea-leavel. There are many places of tourist interest in and around the city. You can move from the sub-tropical heat of the lower vally to the cold of rugged mountain slopes that reach upto areas of perpetual snow. 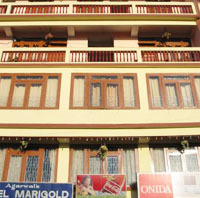 Hotel Marigold has well furnished Super Deluxe, Deluxe and Standard rooms with a panoramic view of mountains and world famous Rumtek Monastery. 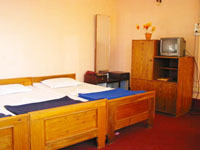 All rooms have color televisions with multi-channel cable facilities, inter-com, attached bath with 24hrs. Running hot and cold water. 1. 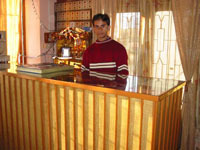 Well furnished rooms with personal bathroom.